So I got myself a minor job for the summer. I will be working with the eye team on Mondays and Wednesdays for the next few weeks. Today was my first day on the job. We start the morning at 6:45 am when we head to the hospitality centre. During the morning the patients are seen by the opthalmic and eye tech specialists. If we are able to help them they are given a date for surgery. After lunch the patients who are seen do not necessarily need surgery; many of these patients need glasses to improve their vision. They are given an eye exam and then the appropriate glasses. Here are some pictures of the eye team taken by our Communications Department earlier this year. 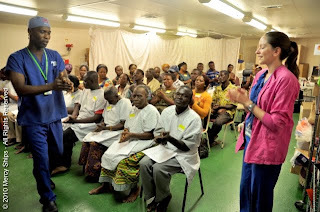 To see what a day at the eye clinic looked like in Benin click here.